The junior program at GCC is for anyone between the ages of 7 and 21. Our primary objective is to have fun and develop a life long passion for curling. As curling is a game of etiquette, we encourage and promote good sportsmanship both on and off the ice. This program is for those aged 7-18 who are just learning how to curl. 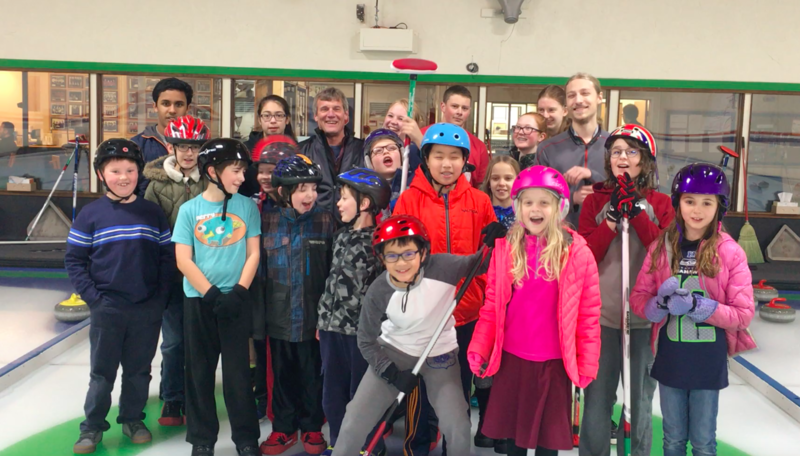 During these sessions, kids will learn the basics of curling, work on skill development, and gain an introduction into the strategy and etiquette of curling. Kids are divided into groups according to their age and skill level. In addition to regular curling rocks, we have “little rocks” which are specially designed, lighter versions of regular curling stones that make it easier for kids to slide their rocks down the sheet. Each session focuses on skill development, strategy and etiquette along with an actual game. After the game, teams engage in one of the most important aspects of the sport - socializing with food and drinks (in this case, hot chocolate!). All curlers are required to sign both a waiver and concussion protocol before going on the ice. Waivers will be provided at the club, or you can save time by downloading the forms, completing and then bringing it with you. Curlers under 18 years of age must have a waiver signed by a parent or guardian before going on the ice. If a parent isn't coming to the event, you can simply send the completed forms with your child. Basic equipment (brooms, grippers and sliders) will be provided. Participants need only to bring a helmet and wear clean, flat soled shoes. (Tennis shoes or sneakers work well. Running shoes that are wide work less well.). Helmets can be any style (hockey, ski, bike etc..), but are required for all participants. If you don't have a helmet, we have a few available for use. Wear loose fitting pants like sweatpants or yoga pants - not jeans - and a sweatshirt. Dress in layers - it can be chilly on the ice, but you'll heat up quickly once you start playing and sweeping. Gloves, not mitts, are also good to keep your hands warm. SPRING 2019 - Sunday, April 28 and May 5. To register, please email Rob McDade at juniorltc@curlingseattle.org. The Friday Juniors League is on Fridays from 4:30pm to 6:00pm. Registration is limited to 40 curlers. Registration priority is given to Junior curlers from the previous year. Otherwise, registration is first come, first serve. This year the league will be split into two sessions: September - December and January - March. First night of Junior League is September 28. The Junior League is open to junior curlers of all ages and abilities, however, all participants must have attended a Junior Learn-to-Curl session or have prior curling experience. Players will be assigned to teams each week so that we can provide a challenging and fun environment. Depending on the skill level of the Juniors registered, we may utilize a combination of full sheets, half sheets and little rocks. Games are usually four to six ends in length and instructors are available for advice during play. Following the game, there is some off-ice time to enjoy snacks and socializing with the other teams. Each junior curler will be assigned a date to provide snacks. More information will be available during the first few weeks of league play. To register, log in to your account and follow the link to online registration. If you’ve never logged in or don’t know your password, go to password request and follow the instructions. For accounts we made for members, your user name is your first name and last name separated by a space. Payment options for online registration are PayPal (includes credit cards), or a check delivered to the club in person or by mail. Junior curlers will still need to complete a waiver and concussion protocol form and drop that off at the club prior to the first night the curling season. Please download the waiver here. Effective January 2016, all participants 13 years of age & younger must bring and wear a helmet while on the ice. We will not be making exceptions and the club will not be providing helmets. Properly fitting bicycle, skateboard, ski, snowboard, and hockey helmets are examples of typically acceptable options. There are others which can also work, and the Junior Coordinator will have the discretion to approve or reject adequacy of head protection. The Granite Curling Club Junior Bonspiel is scheduled for January 26-27, 2019. This bonspiel welcomes curlers under age 21 from USA and Canada. Curlers will play at least 3 games with their first game starting on Saturday morning. Teams can be any combination of boys and girls. Participation is open to all juniors who have the ability to play with regulation size rocks to the full house and complete a standard 8 end game in 2 hours. If you are unsure about your curlers ability, please ask. Depending on the number of entries for the bonspiel, we may offer an novice division for those juniors who are not quite ready for a competitive game. Please indicate your skill level when you register and I will advise everyone by mid-January if we can accommodate a novice division. Cost is $200 per team. If you're interested and need a team, send us email and we will work to find a team for you. Each year, junior curlers that would like to play competitively have the opportunity to form teams and compete in two different National events where they will compete against Junior teams from across the country. There are two divisions: Junior Women and Junior Men. This event is open to Junior curlers 21 years of age and younger. Of the two national championships, U21 is by far, the most competitive. Teams complete by participating first in a qualifying bearth and then advancing to the Junior Nationals event which will be held January 12-19, 2019 in Two Harbors, Minnesota. The winner will then go on to represent the USA at the World Junior Championship's February 17-24, 2019 in Liverpool, Nova Scotia, Canada. This event is open for Junior curlers 18 years of age and younger. In order to participate, teams must first playdown and secure a spot from their curling region. The winning team for both Junior Women and Junior Men will then advance to the U18 National Championships on March 12-17, 2019 in Chaska, Minnesota.